Students expand their global awareness by collaboratively researching & designing solutions to address relevant and authentic global issues. All students in the Global Challenges course dive deeply into the UN Sustainable Development Goals to develop a global perspective and to discover a problem that they are passionate about solving. Students work collaboratively to propose research and design solutions that address relevant, authentic global issues, and by so doing, become more empathetic to the world around them. Several years ago, qualitative and quantitative data confirmed what our middle school teachers already knew: that while our students are academically successful, we needed to create a personalized learning opportunity which would harness the passion of middle school students, focus them globally, instill research and design skills in problem-based learning, and create a sense of empathy for different cultures and peoples around the world. 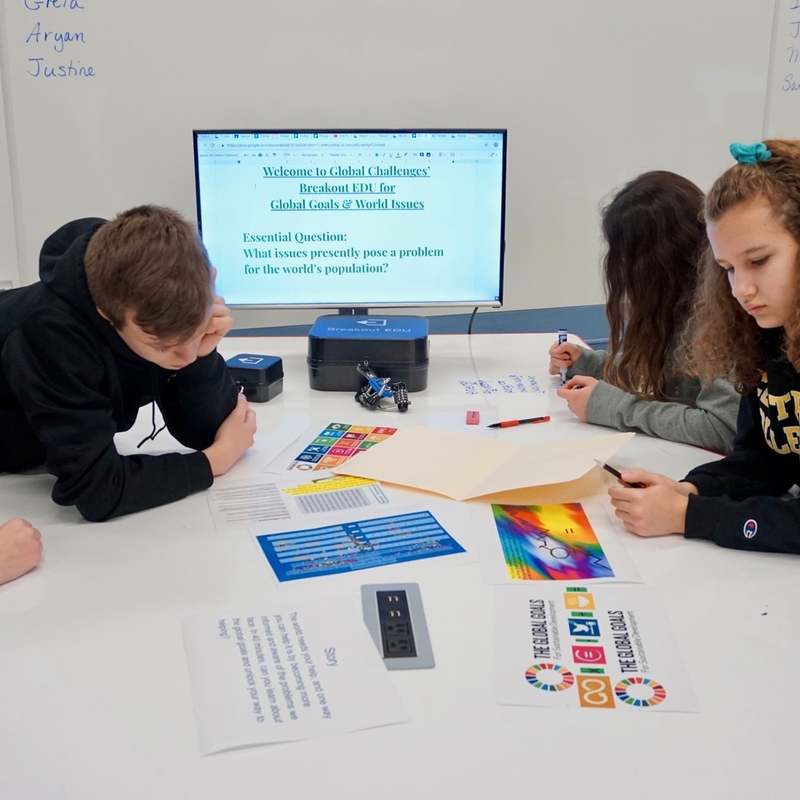 We turned to the United Nations’ Sustainable Development Goals to provide a foundation for the seven and a half week Global Challenges course for our 7th graders. We felt that the UN’s platform was thoroughly research-based, forward-thinking, and allowed for middle school students to understand both the wide-ranging global issues and the reflection in our local area. We realized that if we could focus the students to be more globally minded now, then they could continue this mindset as they become young adults. We also believe that the UN’s goals capture a wide range of multifaceted problems, which would allow each student to be challenged depending on his or her individual level and personalized interests. Essential Questions: What does the world look like as a whole? What makes up a culture? Who am I as a person? How do stereotypes rob us of a richer understanding of the people around us? Essential Questions: How do multiple perspectives help tell the “whole” story? How can I show empathy towards others? How can stories illustrate empathy? Essential Questions: What issues presently pose a problem for the world’s population? How might global challenges affect others? What makes a source credible? How can I conduct responsible research? Essential Question: How can we make positive changes in our lives, space, school, and community? After implementing the Global Challenges course for the past two years, we have found that the class brings in a fresh, global perspective for our students. The curriculum is innovative in both thought and design, and captures the passion of middle school students who are eager to find out who they are, what they believe, and instill a belief that they can change the world. We have also found that the course is impactful; several of our students have completed the course and then have continued to actually implement locally their solution to a problem identified by the UN. As an example, one of our students researched Goal #2: Zero Hunger, which inspired her call to action to partner with a school-based club to raise funds and food to donate to the local food bank. 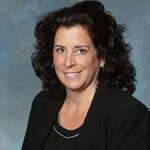 While this type of learning is new for some, we recognize that it can ignite their passion and instill confidence to make a difference in their own lives and those of others. Finally, we believe that the Global Challenges course can be easily replicated and scaled to other localities in other countries. We are happy to share the curriculum and links to the free or open-sourced resources used in this course, and invite others to find credible resources that can be shared with our students and teachers as well. Since the UN’s goals are universal, we believe that all organizations can find projects which are meaningful and impactful for their students, and can implement Call to Action invitations as needed. We are eager to continue building the course and partner with other schools, organizations and experts around the world to build an authentic audience and develop global citizens. Lastly, we have been attentive to and soliciting input from students in the Global Challenges course to determine if the course is meeting the intended outcomes. This past fall, our middle school students and teachers embraced the #BeTheKindKid movement and the “Stronger than Hate” campaign by designing impactful opportunities for students to be kind and empathetic towards other people. For these reasons, we believe that the Global Challenges course has been successful, and look forward to the continued development and impact that this work can have on our young people. Online, print and activity resources are needed, many of which are freely available. Computers or one-to-one devices are of great benefit but are not necessarily required. Depending upon the learning event, facilities include a traditional classroom, large group instruction area, and the library media center. Additionally, having a creative student-centered space to work and learn can foster active participation and engagement. Collaboration with other teachers and staff provides opportunities for cross-curricular connections. Identify possible connections within your current curriculum that align with the UN Sustainable Development Goals. Secure resources to assist in fully understanding the UN Sustainable Development Goals. There are many freely available online resources. Allow students to Identify goals that are of most interest to them to study. Consider ways to design student research focused on a call to action. Provide students with an audience to share their call to action. Encourage students to further act upon their call to action. Their call to action should be practical and sustainable. Look to grow your audience over time. A new way to teach traditional poetry education using music, art & television to create & use songs that are entertaining and appealing to children. Making stories to create imaginary contexts for learning.